Uruguay became the first team to depart from quarterfinal in FIFA World cup 2018 Russia They were beaten by France, where Raphael Varane and Antoine Griezmann netted for France. Finally, France have just won one of the eight previous meetings against Uruguay. Else, either Uruguay have won the game or drawn against the French. But France turned the result in their favour this time and advanced to semifinal. Absence of Edinson Cavani, due to injury against Portugal in Round of 16, was clearly seen for the Team Uruguay. Both team were creating equal composure in first 45 minutes and Varane happened in 40th minute for France. France take their lead when Griezmann floated a freekick towards the middle, where Varane Jumped and directed the ball into the back of the post. It is interesting that Varane has scored only 3 goals for France and all of them with a header. Second half turned out to be nightmare for Uruguain goalkeeper Muslera, when Muslera made an expensive error and conceeded a goal in 61st minute. Antonio Griezmann found some space and he fired right to the Muslera from the edge of the box, but Muslera's attempt to palm the ball let ball the right into the goal giving France a 2-0 lead. Muslera will surely remember thise error for the rest of his life. Later, no efforts from either side could produce any goals in remaining time. Final whistle, France celebrated their victory.on the other side Uruguains rolled down in tears. It all started when Fernandinho scored own goal in 13th minute and gave Belgium an early lead. Both teams were off to a good start, but at the end of the day, Belgium has something to be proud of whereas, Brazil got knocked out of quarterfinal once again here in Russia with 1-2 defeat. 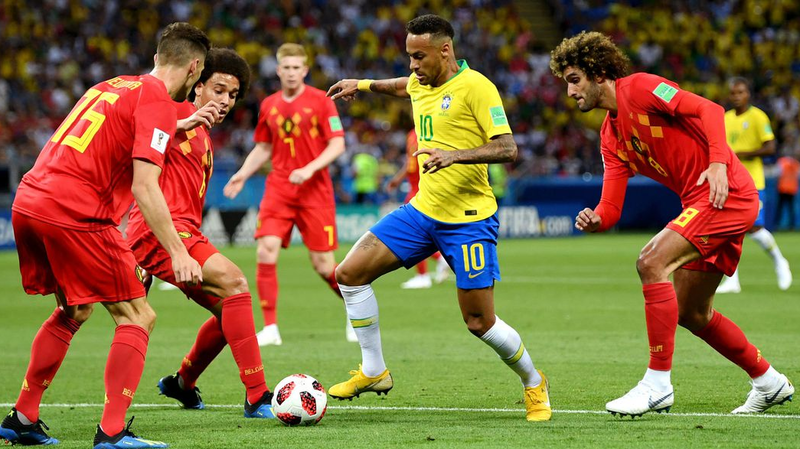 This fixture of Brazil Vs Belgium was their 4th meeting so far, where Belgium won once in 1963 and Brazil all three meeting and this once again Brazil got knocked out of World cup from European team, Belgium from Quarterfinal. Team Neymar got into more trouble when Kevin De Bruyne perfectly converted the Romelu Lukaku's pass into ta Goal in 31st minute.That was once again superb counter attack from Belgium Team, which they recently did against Japan in 94th minute. Conceeding two early own goals for Brazil dismantled their team whole first half. Neymar and the company tried hard to press more and more on the opposite side. It all came to nothing until the first half. Brazil seemed to be Dominating side from the begining of the 2nd half with some substitutes. Roberto Firminho came in for Willian, Douglas Costa for Gabriel Jesus and Renato Augusto for Paulinho. Just 3 minutes in, Renato Augusto scored a header from Coutinho's smart air ball in 76th minute and tried to bring team brazil right back into the game. but Philipe coutinho and Douglas costa missed a critical goal scoring opportunity and costed team a glimpse of hope. Full time its Belgium 2-1 Brazil. With this result, Brazil has been now eliminated by Europeans in each of the last four Fifa world cup editions (France in 2006, Netherlands in 2010, Germany in 2014 and now Belgium).Belgium's victory today is their second ever win against Brazil and their second ever trip to semi-final, previously Belgium reached semifinal and were defeated by eventual winner Argentina in 1986.